I recently noticed an advertisement on facebook (I believe) for a product called Aeroshot and it looked like nothing I had ever seen before when it came to energy solutions. I had to email them and try it out since it had me so curious. They graciously sent me over a ton to try out and even included their chocolate shots as well! "AeroShot™ Energy is an air-based shot of energy delivering a unique blend of 100 mg of caffeine plus B vitamins that starts working right away—anytime, anyplace. No calories to fill you up, no liquids to slow you down, and no mystery ingredients found in most energy products"
This has to be one of the most unique products I have tried in a very long time. I first gave these a shot at my mothers since she is a monster-aholic. The weird thing about these is it almost as if you are taking a puff off an inhaler of some sort or honestly even resembles that of a e-cigarette. The very first time you try be prepared to be a little in shock as you are sucking in a puff of powder. Very weird yes but if you can get over the initial shock of it, they become easier and easier to take. In fact I just had a bit of the raspberry flavor before starting my review. My mother was not impressed but because she could not get over the sour taste of the lime flavor. Kevin thought they were ok and said he would use them again if they were readily available. Amy and myself have fallen in love with them! I think they are great and extremely convenient! I feel slightly energized when I use these and had no jitters whatsoever. 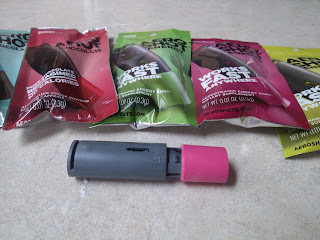 The Chocolate Aeroshots are a nice perk for those dieting or chocolate freaks out there since you get the quick burst of flavor with no calories. They can help enhance the flavor of other desserts and meals if you take a shot beforehand. I have to say these I wasn't a huge fan of - I like the energy not the sweets! Recommendation: I think this price is not only very comparable to other energy options but maybe even on the cheaper side since you can use them more than once. They are packed with vitamins, have zero calories, and are super convenient. I WILL be ordering more I am sure as I'd love to just have a readily available supply for myself throughout the day! 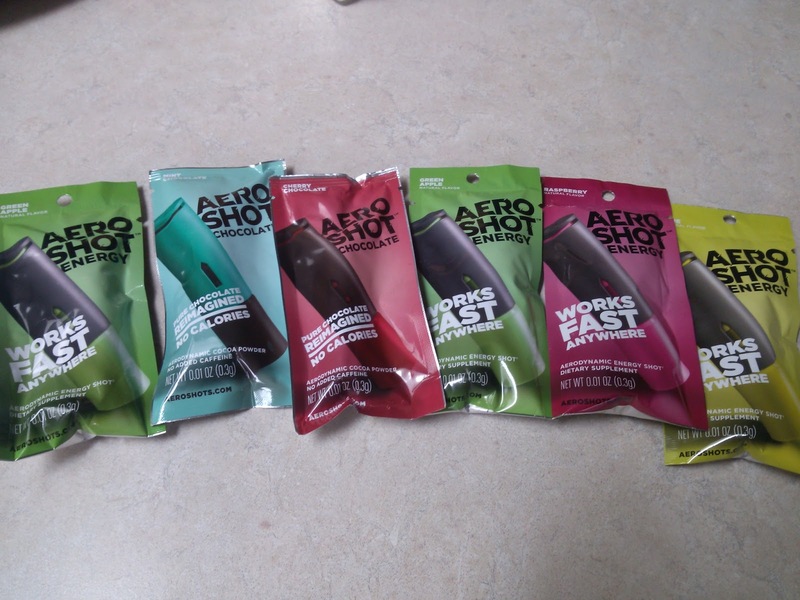 Giveaway: AeroShot is going to give one of A Lucky Ladybug's lucky readers a 12 pack to try of their own to try! I'd try the chocolate "flavor"
I would try the Raspberry. I have no idea if it will work but what a cool concept. I think chocolate would quickly become my first choice. I would love to try the Green Apple! I love the clover background! My clover plants just sprouted! We'd like to try Raspberry.